Feijoas, pronounced feejowa, are everywhere at the moment. Large baskets of them appear on the office kitchen table almost every day and they don’t last long. People love them. When going to NZ you expect the dark green hairy kiwifruit to be the national fruit obsession. And yes kiwifruit does indeed have its place here. But the real folk hero is the Feijoa. I had not seen or heard of Feijoas until I got to New Zealand in Autumn. I had no idea what it was when somebody offered one to me. I have not looked back since though and join the national admiration of this lovely fruit. It’s a fruit that does have some South American origin from a long time ago and since it got here the kiwi’s have embraced it as their own. The trees and hedges grow amazingly well in the moderate NZ climate and if you have a garden there will be a feijoa tree in it. It is hard to explain what a feijoa tastes like. Its a strong but at the same time quite soft sweet taste and smell. It can be quite an overpowering taste. Most kiwis are especially proud of the feijoa vodka. It is a real NZ icon, and if you have never tasted feijoa before, I would not recommend staring with this Vodka! It’s not unsurprisingly that of all fruits NZ has taken so much to the Feijoa. It fits so well with the kiwi’s. From the outside it looks nothing special, just green and egg shaped. But when you look a little further, once you cut it in half, it as got a beautifully designed pattern with this unexpected taste. A fruit worthy of being another Kiwi. 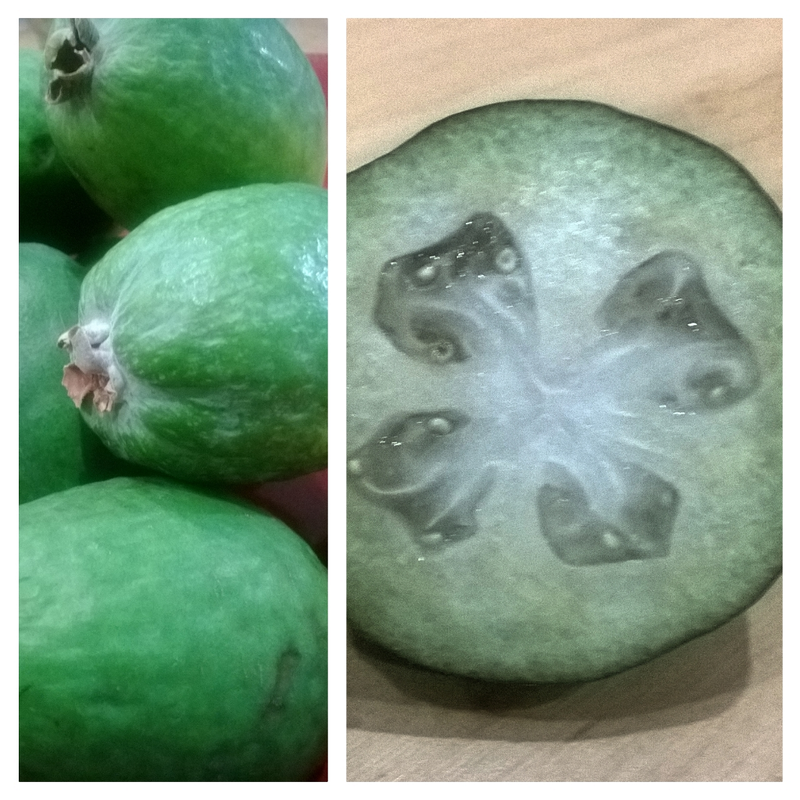 This entry was posted in A to Z challenge and tagged feijoa, fruit, kiwi, new zealand, NZ icon. Bookmark the permalink. Thanks! The A to Z challenge is so great for that discovery isn’t it! And so easy to write about NZ, as there is so much great stuff to share about it. and Drupal. The reason I ask is because your design and style seems different then most blogs and I’m lߋoking for sometɦing completely unique. P.S Apologiеs for getting off-topic Ьut I ɦad to ask!